Sen. Lisa Murkowski (R., Ala.) wrote in an op-ed published Tuesday that she supports Republican efforts to repeal Obamacare's individual mandate. "I have always supported the freedom to choose. I believe that the federal government should not force anyone to buy something they do not wish to buy in order to avoid being taxed," Murkowski wrote in her piece for the Daily News-Miner, an Alaska newspaper. "That is the fundamental reason why I opposed the Affordable Care Act from its inception and also why I cosponsored a bill to repeal the individual mandate tax penalty starting as early as 2013. And that is why I support the repeal of that tax today." Murkowski's announcement comes as a welcome surprise to Senate Republicans, whose current tax reform bill repeals the individual mandate, which forces most Americans who do not have health insurance to pay a fine. 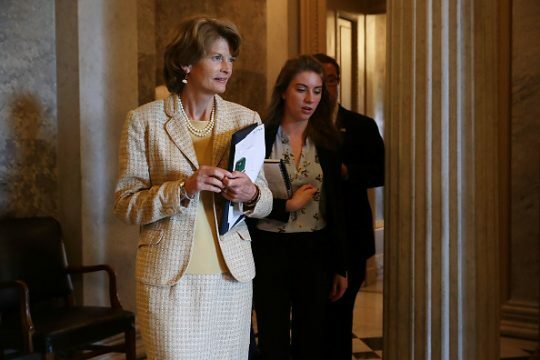 Earlier this year, Murkowski was one of three Republican senators who did not vote for the Senate GOP's so-called "skinny" repeal of Obamacare. In her op-ed, Murkowski defended her no vote, saying the plan would have repealed Medicaid expansion. "Over the course of this year, the Senate has considered bills that would have repealed Medicaid expansion, completely transformed the base Medicaid program, converted the individual exchanges into a block grant program, cut Planned Parenthood out of Medicaid reimbursement for a year, and other measures," Murkowski wrote. "All of those bills went far beyond the fundamental problems presented by the ACA and would have unnecessarily taken away access to care from those who need it most." Murkowski's op-ed appears to indicate that she will vote for the Senate GOP tax bill, though she did not discuss her views on the legislation in her piece. Sen. Rand Paul (R., Ky.) has argued that an additional $300 billion in tax cuts could be possible if the individual mandate were repealed. Senate Republicans can only afford to lose two votes to pass their tax reform bill. Sen. Ron Johnson (R., Wis.) has expressed his opposition to the legislation in its current form but is open to supporting it if certain changes are made. Sen. Susan Collins (R., Maine) has also expressed several reservations about the legislation but has not explicitly said she opposes it. This entry was posted in Issues and tagged Individual Mandate, Lisa Murkowski, Obamacare, Republicans, Ron Johnson, Tax Reform. Bookmark the permalink.